Published January 14, 2014 at 191 × 300 in Thailand. Ploy was born on May 16, 2004. 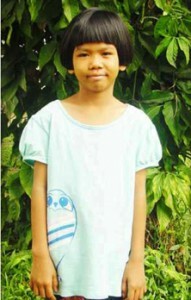 When her parents abandoned, Ploy was taken into the care of her grandmother, who later passed away. She then moved in with her aunt for a few years. When her aunt became sick, Ploy was brought to the shelter home. She will be attending Year 2 in primary school.